Dried guajillo chiles are available at iGourmet.com. This is Page 6 of an eight-page glossary of chile peppers. It includes such popular chiles as the habanero and jalapeño. Click on the black links below to see other pages. And take a look at all of our food glossaries. The dorset naga chile (Capsicum chinensis) is an extremely hot subspecies of the naga morich chile from Bangladesh, where it is sold with a health warning. Samples from different sites, seasons and states of maturity show heat levels from 661,451 SHU to 1,598,227 SHU, one of the hottest heat levels ever recorded for a chile. The chile of Spain’s Basque country is as treasured there as paprika is in Hungary. 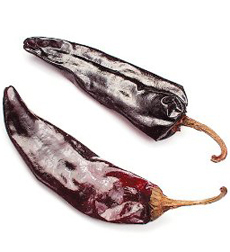 It is believed that the chiles were introduced into the Basque Nive Valley by Gonzalo Percaztegi, a navigator who voyaged with Christopher Columbus (who brought chiles to Spain in 1494), in 1523. Basques often use Piment d’Espelette instead of black pepper; it is prominent in local dishes such as piperade. The pepper is sold in a powdered spice form: The peppers are dried naturally, baked in an oven and ground into powder. The AOC-protected chile has its own official website (in French). Here’s more information on espelette peppers, plus recipes. Piment d’espelette. Photo courtesy Wikimedia. 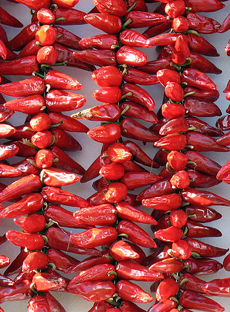 Fresno chiles are available in red and green varieties, the red being the sweeter of the two. On the Scoville scale, it ranks with a serrano. 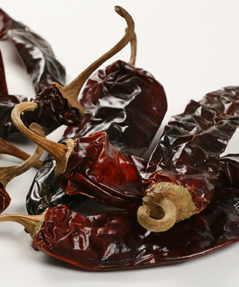 Red Fresno chiles are found in a broad range of Latin dishes. They are delicious added to soups, stews and dips or roasted and enjoyed whole with barbecued meats and poultry. A thin-skinned chile from Mexico with complex notes, including a green tea flavor, berry notes and a faint pine nut finish, often used in seafood dishes. It has medium heat (5 on a scale of 10) and a deep red color that intensifies when the chiles are soaked. Dried guajillo chiles are available from Amazon.com. The hottest chile grown in central America or the Caribbean (10 on a scale of 10), the habanero is named after Havana, where it is believed to have originated, and was later introduced to the Yucatan peninsula. 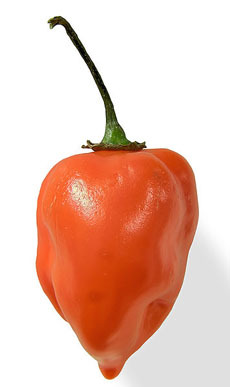 The habanero is the most intensely spicy chile of the Capsicum genus. Unripe habaneros are green, but the color at maturity varies. Common colors are orange and red, but white, brown, and pink are also seen. The lantern shape resembles a bonnet; the typical ripe habanero is 1 to 2-½ inches long and 1-3/4 inches in diameter. It is loosely related to the Scotch Bonnet and the Jamaican hot chiles. Most habaneros rate 200,000 to 300,000 SHUs—30 to 50 times hotter than the jalapeño. Its fierce, intense heat and flavor mix, with an underlying delicate fruity, citrus-like flavor, mix well with tropical fruits and tomatoes. It is used extensively in salsas, chutneys and seafood marinades. The longer the chopped chiles infuse in the sauce, the more powerful the flavour. Note that there is no “ñ” in habanero. It’s a very common mistake made by English speakers. The correct pronunciation is a-va-NEH-ro. Fresh habanero chiles can be found in colors from the more common red and yellow to brown, pink and white. Photo courtesy Wikimedia. One of the most prized chiles of the southwestern U.S. is the Hatch chile from New Mexico, with a meaty flesh and mild-medium heat. 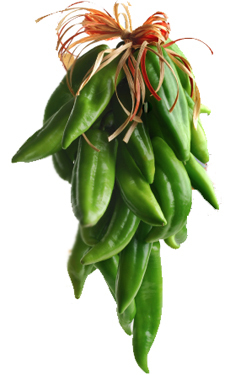 The chiles are named after the original growing area of Hatch, New Mexico in the Mesilla Valley, just north of Las Cruces. The valley, which stretches along the Rio Grande’s southernmost bend before crossing into Texas and Mexico, is covered with row after row of green, leafy Hatch chile plants for most of the summer. Every September, after the harvest, there are formal and informal Hatch chile festivals. In towns throughout New Mexico, the aroma of roasted chiles fills the air, along with the sounds of the Hatch chiles popping and crackling as they roast in propane-powered roasters. Chefs say that the intense sunlight, hot days and cool nights in the valley result in a uniquely flavored chile. Favorite recipes include Chile Con Queso, Chiles Rellenos and Chile Verde. The roasted chiles are also used in salads, soups, stews, dips and sandwiches. Roasting instructions. Hatch chiles. Photo courtesy Melissas.com. Chiles are high in vitamin C (they contain more than oranges and broccoli), are a good source of fiber (if you can eat enough of them), and the antioxidants in the capsaicin may fight cancer and heart disease. Flat with a shiny green color, the jalapeño is a small to medium-sized chile that is prized for the hot, burning sensation that it produces in the mouth when eaten. 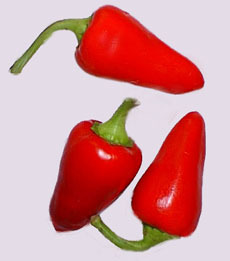 It is a sweet, medium heat—5 on a scale of 10—and the chile is used in sweet dishes such as well as savory ones. 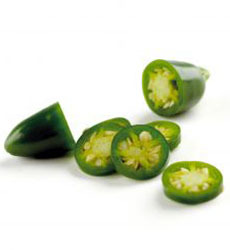 Jalapeño can be found fresh, roasted, pickled or smoked (when it is called a chipotle). It has a heat level that varies from mild to hot depending on how it was grown and how it was prepared. It is named after Jalapa, the capital of the Mexican state of Veracruz. The jalapeño is America’s most popular chile and one of the most popular in Mexico as well. Beyond salsas and other Mexican foods, add some jalapeño to sauces and soups, or infuse in vinegar to add a kick to salad dressing. One of the most popular chiles in America, the jalapeño can be found in green and red. Photo by Brybs | SXC. The small red chile found in Asian dishes. This chile is very flavorful and spicy with medium high heat.